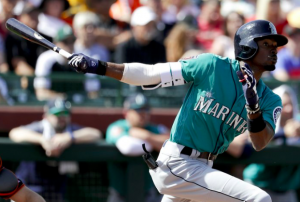 When Robinson Cano broke his hand and was poised to miss a few weeks, the Seattle Mariners were quick to say Dee Gordon would not be moving back to his old position to replace him. But with Cano receiving an 80-game suspension after testing positive for a banned substance, the Mariners have changed course. Starting Friday, Gordon will be Seattle’s primary second baseman, at least until Cano returns form his suspension in mid-August. Gordon served as the DH during Thursday’s loss to the Tigers. But before the game, he took groundballs at second base for the third straight day. It was all part of the plan by Mariners manager Scott Servais to ease Gordon back to playing second base. When the Mariners traded for Gordon over the winter, they immediately moved him to center field, a position he’d never played previously. Despite spending most of his minor league career as a shortstop, the Dodgers moved Gordon to second base permanently in 2014. Since then, he’s played over 500 major league games at the keystone. He won a Gold Glove at second base in 2015. According to metrics, he saved 9.8 runs defensively with the Marlins last season. However, Gordon is still expecting some growing pains as he transitions back to the infield. Of course, with Gordon moving to second base, the Mariners will now have to reshuffle their infield. For most of the season, Guillermo Heredia and Ben Gamel have shared time in left field. Moving forward, Gamel will play every day in left field while Heredia will play in center. Gamel hasn’t produced much offensively this season, but with no outfield depth outside of utility man Andrew Romine, the Mariners don’t have much of a choice. The Mariners initially brought up veteran infielder Gordon Beckham to help replace Cano. His presence is less necessary with Gordon moving to second base. It will be interesting to see if the Mariners try to add outfield depth with Gordon no longer playing there. Seattle has veteran Jayson Werth in triple-A. While Werth hasn’t hit much this year, he could be a viable platoon partner for Gamel in left field. Even before Gordon has played his first game of the season at second base, there are rumblings of him staying there after Cano’s return in August. With Nelson Cruz not under contract beyond this season, the Mariners may want to transition Cano to a full-time DH, perhaps with time at first base mixed in as well. It’s perhaps too soon to speculate about Gordon’s move back to second becoming permanent. But if all goes well for him at the keystone over the next three months, it’s something the Mariners will no doubt consider.